We do not believe that Bitcoin meets Waverton’s requirements of an investment and instead possesses many of the characteristics of a speculative bubble (rapid price appreciation, difficulty in assigning value, evangelical support from promoters etc.). However, we do believe that cryptocurrencies and the blockchain technology behind them will continue to gain wider usage, but whilst remaining on the lookout, we do not currently see any obvious means through which our clients can invest in this growth without taking unnecessary risks. Payments are processed between “wallets” (similar to an email address) by a distributed network of computers (aka “miners”), rather than through the conventional banking system. The miners are rewarded through collectively finding the next solution to an infinite cryptographic problem (the “hash function”). When a miner determines a solution, the other miners verify it, before they all start looking for the next solution in the series. 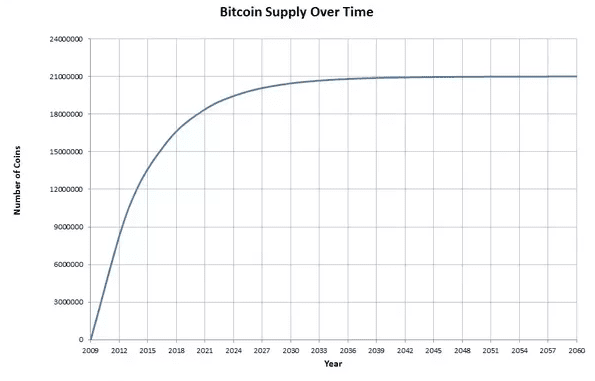 The supply of Bitcoin grows in-line with a predefined rate (4% in 2017) which tapers off until the last Bitcoin is produced in 2140. 80% have already been produced (see chart below). All transactions are in the public domain, but the identities of owners behind the transactions are not revealed. This public ledger of transactions is called the “blockchain”. Bitcoin wallets, unlike bank accounts are beyond the reach of any regulator. Only the holder of the password has access, if this is lost the funds are irretrievable. Online exchanges – There are many of these and their popularity is growing rapidly. The largest one in the US (Coinbase) has 13m accounts, which is more than Charles Schwab. However, if an exchange gets hacked the cash and or Bitcoin stored there are typically stolen. There have been some high-profile cases of this. Futures – As of December 2017 the CME & CBOE have been quoting Bitcoin futures. This is another way to speculate on the price of Bitcoin. Settlement is in US dollars, not in Bitcoin. Meet-ups – There are websites advertising where you can meet up with people to exchange cash for Bitcoins. The buyer presumably witnesses the seller send the Bitcoin to their wallet before handing them the cash. Could the price of Bitcoin continue to appreciate? It could, given that the large demand from those wanting to store assets out of the reach of any regulator or legal body. Examples are those wanting to avoid capital controls (e.g. China), money launderers, drug dealers and other criminals. Limited supply: Unlike other stores of value (like gold) where as the price increases, more is produced, the number of Bitcoins that are created each year is independent of their price and will keep declining until 2140, when the last one is produced. The cost of processing a Bitcoin transaction has increased over the year (see chart below) and the processing time of 10 minutes is much slower than traditional payment networks. The Bitcoin platform can handle approximately fifteen trades per second; VISA handles 46,000 per second at peak times. The more widely adopted Bitcoin becomes the slower the average transaction will become; in this respect Bitcoin has diseconomies of scale. There are hundreds of other cryptocurrencies many of which have significantly lower transaction fees and faster payment processing times than Bitcoin. With time, these will likely win market share from Bitcoin. There are no barriers to entry to create a new cryptocurrency. The industry is evolving very fast and the few that eventually get widespread adoption may not have been created yet. Regulation: Given the appeal of cryptocurrencies to criminals there may well be an international response to monitor the industry, probably through enforcing Know Your Client checks at the exchanges. The announcement of this could be extremely detrimental to the price. Blockchain technology is here to stay. Like much technology it may well impact us without us realising. There are many uses for a register which multiple agents can contribute to, but none can corrupt. We do not believe that the price of Bitcoin is grounded in anything other than the greater fool theory and in that sense it is just the latest in a long history of speculative bubbles. However, the technology behind Bitcoin—blockchain—will appear in mainstream guises from payment ledgers to legal contracts. We will be following the development of this technology with interest, we do not need to speculate on Bitcoin to do so.